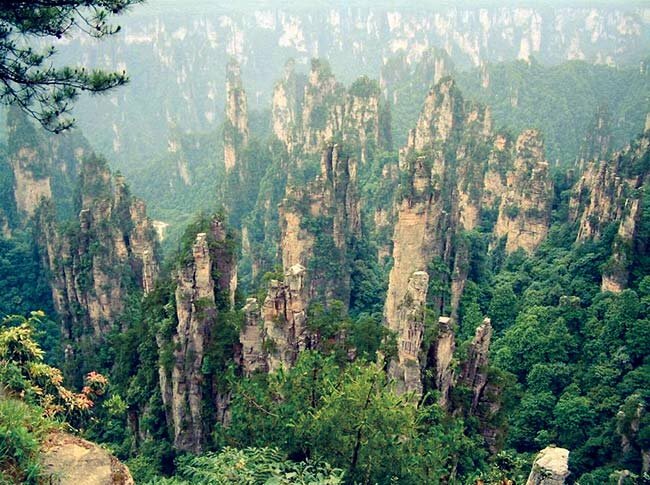 In Hunan, visit Zhangjiajie, a world heritage site acclaimed for its fantastic formation of peaks, crystal clear waters, and spectacular karsts caves and forest. Sichuan is famous for its spicy cuisine, and also home to world heritage sites, Huanglong, famed for its landscape and multihued ponds, and Jiuzhaigou. Legend has it that an immortal dropped a mirror, shattering into 108 pieces and formed the various sized and peacock blue and emerald colored lakes in Jiuzhaigou. Our China vacation starts as we board a flight bound for Changsha, the capital of Hunan. Upon arrival at Beijing, we are met and transferred to our luxury hotel for the night. Board a domestic flight to Changsha. Transfer to the hotel upon arrival. For dinner, a Hunan local cuisine is served. After dinner, we drive around the city for a fantastic night view. Our city tour of Changsha features visits to the Yuelu Academy of Classical Learning. This is one of the four most highly regarded academies from the past 1000 years in China. The Yuelu Academy, founded in 976, is one of China’s most famous ancient academies. It became a higher learning institute in 1903 and part of Hunan University in 1926. The school has just 70 students who are studying for a Masters or PhD in history, philosophy, education and literature. The traditional architecture and calligraphy inscriptions found throughout the grounds attest to the historical and cultural importance of this center of learning. Next, we will visit either the amazing Mawangdui Tombs Museum or the Jiandu Museum. These ancient tombs date back to the Western Han Dynasty (206 B.C. to 25 A.D.) and there lies the remains of Marquis Dai and his wife and son. The tombs were made of large cypress planks. The tombs contained nested lacquered coffins, a Chu burial custom. The mummified body of the wife was so well-preserved that researchers were able to perform an autopsy on her body. A myriad of artifacts, silks, and manuscripts were discovered at this site. The Jiandu Museum is a very interesting site — covering an area of two hectares (almost 5 acres), it houses more than 100,000 bamboo slips and wooden tablets dating back over 1,700 years, which have been unearthed in downtown Changsha since October 1996. The slips and tablets, which were inscribed with characters, recorded in detail the political, economic, military, cultural and geographic information in the ancient Changsha prefecture which was under the rule of Kingdom WU (222 AD-280 AD), according to sources with the local government. This was before the invention of paper and pens. Later in the afternoon, we board a flight bound for Zhangjiajie, world famous for Wulingyuan Scenic Area which is acclaimed for its fantastic formations of peaks, crystal clear waters, spectacular karsts caves and the unrivalled high percentage of forest cover, and is listed as a world heritage site. For dinner we indulge in the local Tujia Minority Cuisine. Today our tour will start with a visit to Tianmen Mountain National Forest Park for an amazing view of Tianmen Cave. Tianmen Mountain is one of the most representative natural sceneries of Zhangjiajie. It is a natural water-eroded cave with the highest elevation in the world with a peculiar huge hole in the mountain. People call it a cave and it has become a major attraction. Many rock climbers enjoy climbing the cave walls. After lunch, we visit Zhangjiajie National Forest Park, the first authorized national forest park in China. As the first state-level forest park in China, Zhangjiajie National Forest Park is clad with a vast expanse of primitive sub-tropical forests. It has been described in many different ways; majestic, eccentric, tranquil, delicate and wild. The park features grotesque peaks, lucid brooks, abundant fauna and flora and a hospitable climate. Golden Whip Stream, the valley filled with peaks and crags, has been praised as “the most beautiful valley in the world”; Ten-Mile-Natural-Gallery, and Baofenghu Lake, all are an integral part of this picturesque park. Before we head back to Changsha to board a flight bound for Chengdu, we make an excursion to Changde to visit the Taohuayuan Scenic Area. Taohuayuan is particularly famous for plum blossom season in April and May. In other seasons, the Taohuayuan tour will be substituted with Liuyeh Lake. This area is ideal for recreation, convalescence and aquatic sports. Within the resort there are White Crane Hill, Flower Hill, and Sun Hill, all are covered with pine and fir trees, and Islets in the lake shimmering like emeralds in blue water. Also, Yinyuan Garden, Wujianping Terrace and Mount Zhangjia, a graveyard since the Warring States Period, add rich cultural atmosphere to the natural scenery. In Chengdu, the capital of Sichuan Province, we will be served the famous Sichuan local cuisine for dinner. Our morning excursions take us to Chengdu Research Base of Giant Panda Breeding and the Temple of Marquis Wu (built in the 6th century). Chengdu Panda Base has not only dedicated itself to giant panda conservation, but has also made great efforts to combine natural scenery and man-made landscapes to create wonderful and humane living areas for giant pandas, red pandas, and other Chinese endangered animals. This non-profit organization has made tremendous strides in wildlife research, captive breeding, conservation education, and educational tourism. On site is a Giant Panda Museum, souvenir and other shops, a book store, and tea room and dining facilities. Sightseeing here takes about 1.5 hours on foot. Electric carts can be rented from private vendors at your own cost, if desired. Later in the afternoon we fly to Jiuhuang Airport to get ourselves ready for tomorrow’s tour to the “Fairyland” Jiuzhaigou. We will stay overnight at Chengdu if the flight to Jiuhuang Airport is cancelled due to any nature elements. In this case, sightseeing tour of Huanglong will be substituted by Chengdu Sanxingdui Museum. This Museum is an archeological museum with excellent modern facilities. The cultural relics in the museum were mostly unearthed from the Three-Star Piles site. Three-Star Piles site is a cultural relic of the ancient Shu (Sichuan). It is an important archeological discovery which changed the people’s understanding of ancient history and culture. If you want to know more about Chinese Shu (Sichuan) culture, make it this one, for the civilization shown by the cultural relics can be called a true wonder. The whole day excursion explores the fantasy of Jiuzhaigou. Legend has it that an immortal dropped a mirror, shattering into 108 pieces and formed the various sized and peacock blue and emerald colored lakes in Jiuzhaigou. This is a world natural heritage site, Jiuzhaigou has been known for its natural wonders in terms of colorful waters appearing to be either magically peacock blue or emerald. All those who encounter it are overwhelmed by the breathtaking beauty of its landscape and lakes, springs, waterfalls, streams, rivers and shoals. Our tour includes visits to Shuzheng Waterfall, Changhai Lake, the River View Pavilion, and Tibetan Village. For dinner the minority traditional cuisine is served. And after dinner, we are entertained by the Tibetan & Qiang folklore dance show. Finish sightseeing in Jiuzhaigou, and proceed to Huanglong, another world natural heritage site, famed for its peculiar karsts landscape and multihued ponds that are set off picturesquely by snow-top mountains, vertical ravines, and vast forests. Return to Chengdu by air. Immediately take a motor coach to the world heritage site, Du Jiang Dam, upon arrival. This irrigation system was originally built in 256 BC by Qin governor Li Bing. It seemed that people who lived along the banks of the Min River were plagued by annual flooding. Lǐ Bīng investigated the problem and discovered that the river was swelled by fast flowing spring melt-water from the local mountains that burst the banks when it reached the slow moving and heavily silted stretch below. One solution would have been to build a dam but Li Bing had also been charged with keeping the waterway open for military vessels to supply troops on the frontier, so instead he proposed to construct an artificial levee to redirect a portion of the river’s flow and then to cut a channel through Mount Yulei to discharge the excess water upon the dry Chengdu Plain beyond. The levee was constructed from long sausage-shaped baskets of woven bamboo filled with stones and held in place by wooden tripods. The massive construction took four years to complete. After the system was finished, no more floods occurred. The irrigation made Sichuan the most productive agricultural place in China. On the east side of Dujiangyan, people built a shrine in remembrance of Li Bing. It is still in use today to irrigate over 5,300 square kilometers of land in the region. Today, Dujiangyan has become a major tourist attraction. It is also admired by scientists from around the world, because of one feature. Unlike contemporary dams where the water is blocked with a huge wall, Dujiangyan still lets water go through naturally. Modern dams do not let fish go through very well, since each dam is a wall and the water levels are different. Tonight, we have a chance to taste the famous Medicinal Food for dinner followed by the entertainment of Sichuan Opera. As one of the principal genres of regional drama in China, Sichuan Opera is particularly famous for its unique skills in “changing countenance.” Sichuan opera is more like a play than other forms of Chinese opera, and the acting is highly polished. The traditional formula is quite systematic with a combination of stunts like face-changing, sword-hiding, fire-spitting and beard-changing with a plot and different characters. Bid farewell to China as we board our international flight to the USA via Beijing.